"Pews do tend to make the congregation feel like spectators in the services, rather than participants"
Editor's note: One of the first things people notice about Russian churches is that most of them do not have pews and that most of the congregation stands upright during their sometimes very long services. Here, Fr. John Whiteford, a well known Orthodox priest from Texas, responds to a question about pews, explaining the logic behind the tradition. There are parishes even in the Russian Church Abroad that have pews. These tend to be older parishes that were established during either the pre-revolutionary period, or during the period of the American Metropolia prior to the post World War II wave of immigration (which is most typical of the older mainstream ROCOR parishes). This is due, I think, to the pressure to assimilate (which was even stronger during those periods than it is today). So obviously, the fact that such parishes exist, and continue to use pews would suggest that our bishops do not consider pews to be intolerable, but our bishops clearly do not encourage them either, which is why you don't see them in most or our parishes. 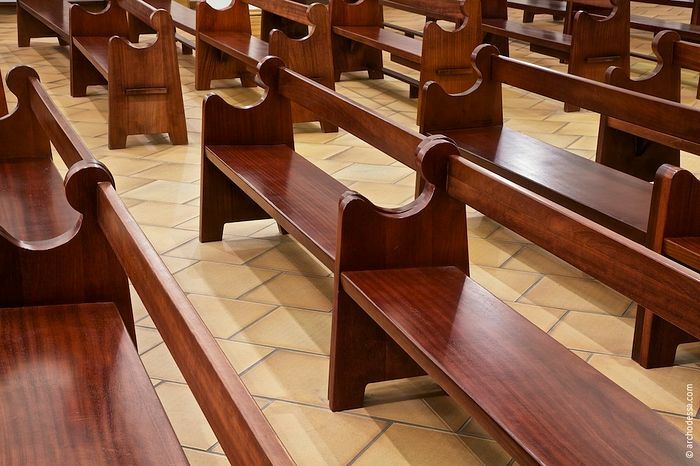 If you are in a parish that has had pews for generations, you probably are not going to get anywhere by opposing them, and so you would need to come to terms with them, if there were no better options to consider. But in a situation in which a parish is considering pews (or rows of chairs, that amount to the same thing), one should certainly express respectful opposition to the idea. However, if those in authority decide to put them in, continuing to oppose them would not be a very healthy position to be in... and so again, you would have to either come to accept the facts on the ground, or look elsewhere, if there were other options. Pews do tend to make the congregation feel like spectators in the services, rather than participants. On the other hand, because we live in a culture in which people are used to sitting through most of a service, there is a tendency in parishes that do not have pews for people to congregate along the walls, and thus not make full use of the worship space. One option I have seen that I think works pretty well, is the use of movable benches with no backs (they seat about 3 to four people, as I recall), that are placed in parts of the Nave of the Church. I observed this in the Old Rite parish in Erie, Pennsylvania, and in my opinion, it worked well, without the usual problems that pews bring, and I don't think I have seen a parish whose services were more pious than that parish. "Most Old Rite faithful try to arrive on time for the services. The benches located in the Church of the Nativity are placed there because the faithful usually arrive several minutes before services begin, thus, allowing them a place to sit before services commence. Also, it is still the practice of the Old Rite to read the liturgically-appointed homilies during Matins and/or Vigils. During the reading of these homilies the faithful sit and listened attentively. When the services do begin, the faithful stand with arms folded with as little shifting of feet and body as necessary."